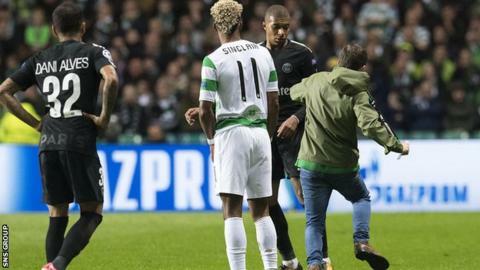 Uefa has fined Celtic £8,900 (10,000 euros) after a supporter ran on to the pitch in their Champions League game last month against Paris St-Germain and tried to kick striker Kylian Mbappe. John Hatton admitted to the attempted assault at Glasgow Sheriff Court. It is the 12th time in six years that Uefa's disciplinary body has punished Celtic regarding their fans' behaviour. In July, Celtic were fined £20,600 after an "illicit banner" was displayed during their game against Linfield. Twenty-one-year-old Hatton, from Belfast, jumped over a metal railing and aimed a kick at Mbappe after Edinson Cavani had scored the French team's third goal in a 5-0 win. He was banned from every football ground in the UK by Sheriff Sukwinder Gill. Uefa's control, ethics and disciplinary body also fined Paris St-Germain £4,450 (5,000 euros) for damage to seats at the match on 12 September.